This trek to the Prashar Lake is a beautiful adventure across gorgeous, green Himachali mountains. You'll find yourself hiking through dense, overgrown forests of pine and oak trees with colourful rhododendron flowers all around. En route, you can stop at vantage points to catch your breath and take in stunning views of mountains in the Dhauladhar range. At your destination, beautiful views of a stillwater lake with reflections of surrounding hills await your arrival. 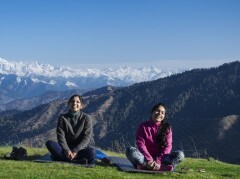 After a night spent around a bonfire, you'll sleep in tents and wake up for an early morning session of yoga and meditation in the lap of Himalayas. Prashar Lake, tucked away at an altitude of over 9,000 feet, is a stillwater lake named after a sage who lived and meditated on the banks of the lake. The picturesque body of water can immediately be identified because of a small, circular island. The locals have often reported the small island to move around the lake several times, giving rise to the curious case of the moving island. The easy, yet enchanting trail, crossed with tiny river streams and rivulets, is perfect for first time trekkers and families looking for a quick escape into nature. • Embark on an easy trek to the Prashar Lake. • Explore the scenic beauty of the Dhauladhar mountains. 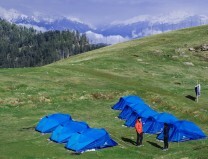 • Spend the night in alpine tents near the Prashar Lake. Travellers are required to follow instructions of the trek leader during the trek to Prashar Lake. Consumption of alcohol, drugs and tobacco products like cigarettes is strictly prohibited during the trek to Prashar Lake. For cancellations made 7 days or more before departure of the Prashar Lake trek: 70% refund. For cancellations made 3-6 days before departure of the Prashar Lake trek: 50% refund. 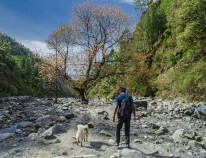 For cancellations made less than 3 days before departure of the Prashar Lake trek: no refund. You'll be picked-up from the Mandi bus stand at 08:00 hrs on day 1 and dropped-off at the Mandi bus stand by 17:30 hrs on day 2. Timings are approximate and may be subject to change or delays. The tour operator reserves the right to cancel or alter the itinerary of the trek to Prashar Lake due to unforeseen circumstances such as bad weather or natural calamities. Travellers will be required to bear the cost of such changes to the itinerary. Mandi bus stand at 08:00 hrs. Mandi bus stand at 17:30 hrs. Arrive at the Mandi bus stand by 08:00 hrs and meet your fellow trekkers. Here, you'll board private vehicles and travel to Kandalu. After a 2-hr drive, you will begin trekking towards the Prashar Lake. After an initial patch of steep incline, the trail will pass through thick forests of pine, oak and rhododendrons. En route, you can stop to admire beautiful views of the Dhauladhar mountains. You will climb up to an altitude of 9,000 ft and reach the Prashar Lake. Here, you can relax on the banks of the lake or visit the nearby temple. Overnight at Prashar Lake in tents. 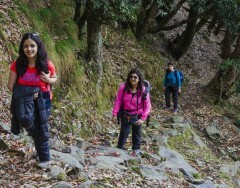 Hike over an easy, mountain trail in the lower Himalayas. Wake up to some hot tea and indulge in a peaceful session of meditation and yoga to the backdrop of the gorgeous Himalayas. After breakfast, pack up your luggage and tents and begin retracing your route back to Kandalu. By late afternoon, you'll reach the road head and travel back to the Mandi bus stand in a vehicle. You will reach Mandi by 17:30 hrs. Your trip ends here. A calming session of yoga and meditation in the morning. Overnight in tents at Prashar Lake. Stay in alpine tents pitched near the lake. Today's meal package includes breakfast only. You'll arrive in Mandi by 17:30 hrs, subject to traffic conditions. Your trip ends here. Mandi is well-connected to major cities of the country via flights to the Bhuntar Airport, located 60-km/2-hr drive away, or board a bus from neighbouring cities in Delhi, Punjab or Haryana. The tour operator will arrange your transport to the start point of the Prashar Lake trek.